What is in the soil under my coil? That is the question! Tonight, I want to talk about something we have all asked ourselves (even if you have only detected for a few minutes). What is making my detector sound like that? I have told many people that for the first few weeks of detecting I was clueless what my machine was telling me. Then I had a very wise Miner tell me that if a signal sounds odd to dig it. His justification was that it could be gold. After almost two years I want to tell you that it is finally clicking. I have been swinging my Ace 250 for 2 years now solidly. I have messed with AtPro’s, Fisher F2’s, and recently one of the White’s detectors that they gave us to use in the Wheat State THer’s classes. While using my Ace I have gotten used to there being 3 types of sounds and 1,000’s of other mixtures of those 3. The 3 sounds are Low tones, Mid tones, and High (Bell tones). Now it took me along time to learn the subtle sounds of the Ace. For instance, I know that 9 times out of 10 a bottle cap will give me a strong bell tone and then a sharp iron drop sound. I started noticing that my ears were getting better when I would find something in my hole and I knew there was another target because the foil I found wouldn’t have given me a bell tone. Now at our recent class I was kind of embarrassed that when a student asked my opinion of a target while he was using the White’s machine that I had no idea what we were hearing. It was at that moment I told myself I needed to educate myself on these sounds. I have been using the White’s machine the last couple of days and it has given me the itch to upgrade machines. It has VDI (visual discrimination indicator), ground balancing, and 9 tones to listen for. I have dug a few coins with it and I’m starting to get the hang of it. It would take me at least 6 months of using this machine to truly learn it. One of the biggest reasons I’ve never upgraded is the fear of learning a new detector. Swinging this machine over the last few days makes me not quite so fearful of that. I saw Miner go through this with his detector affectionately known as Maurice. When he first started with it his finds were not so spectacular. Now that he has been swinging it for awhile he has it fine tuned and he is making it happen. I have also seen guys buy a new detector and grow into it. Where am I going with all this? When you are getting started don’t worry about knowing what every target is before you dig it. Dig as many targets as you can until you learn the what and why behind the sound it’s making. Even as you mature in the hobby there is no guarantee what is in the hole. I think the majority of metal detectors made can get easily confused when you get multiple pieces of metal under the coil. I remember one hunt where I told who I was hunting with that if the target I was listening to wasn’t a silver dime I would sell the Ace. Guess what, I still have my Ace and I’m thankful I was right that time. I also think of all the times I have thought I was digging a deep silver coin only to find a brass hinge, a square nail, or some other miscellaneous piece of trash metal. Keep swinging and thanks for reading. Well today I took a day of vacation from work. The plan was simple find a place that I could spend all day detecting. 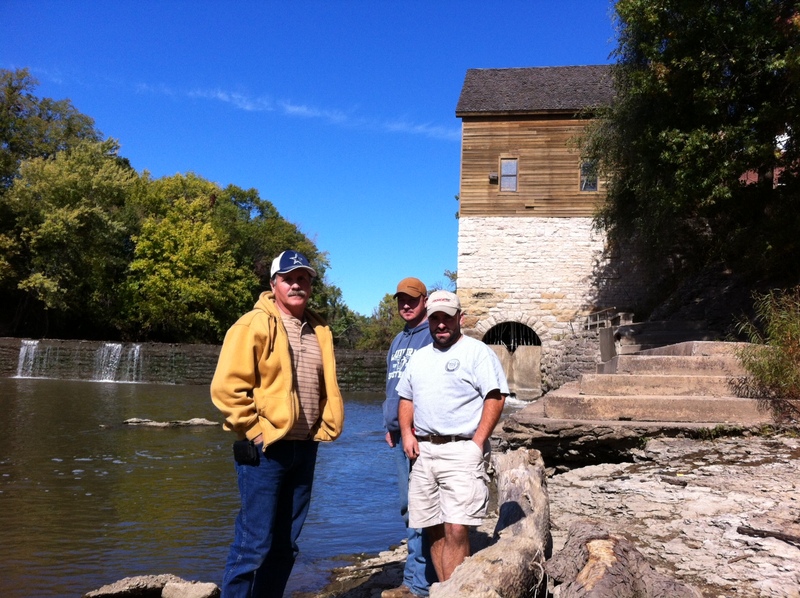 I had invited a few Wheat State Treasure Hunters Members to join me. We ended up with 4 people headed out in the minivan heading east. We started in a little town that was founded in 1864. We found some public land that looked promising. We detected it for a about an hour and a half and found what would be our best finds of the day. 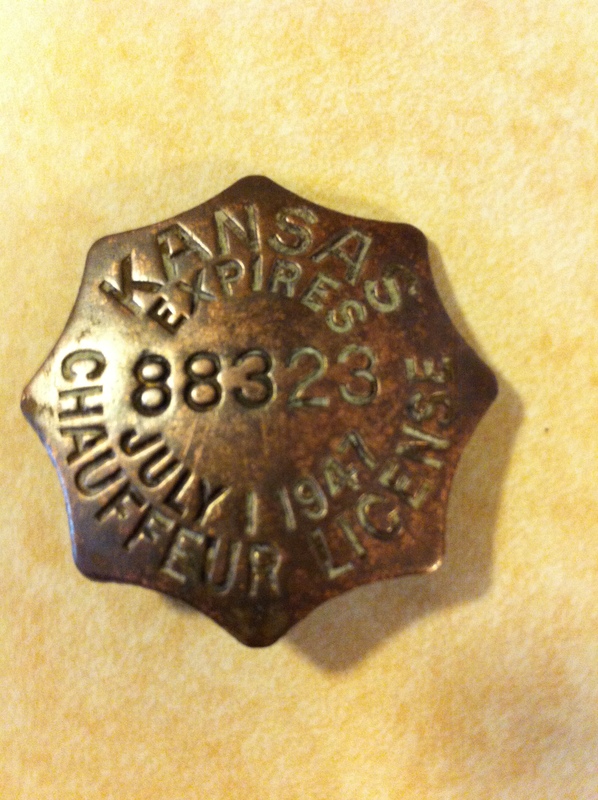 I dug a 1942 wheat, Josh dug a 1919 wheat and then Rodney dug this awesome relic! After that we decided to hunt some old fairgrounds in a neighboring city. There was a ton of real estate here and we hit it for about an hour and a half before everyone’s stomachs were saying it was time for dinner. We ate at the local restaurant and got our bellies full. After that we went and adventured around the old mill. It’s an amazing old building that really takes you back a few years. We finished our detecting Monday at a small town school yard that had a high school built in 1922. The yard looked like nothing had changed since. Unfortunately it seems like someone has worked the site over pretty well. All in all I wish the finds had been a little better but the time spent with good hunting buddies made up for the lack of “juice” during the day! It was a great time and I was thrilled to be with these guys. Like the title says: Sometimes I just want to ramble..
Today I helped the Wheat State Treasure Hunters with the first class we had with the city. The class was awesome and I was pleased to see the turn out and the excitement they showed. I am thrilled to be a part of this group and I am very thankful to have such a neat group of people to share our hobby with. We have several seasoned detectorists in the group and I am always amazed at how much can be learned through simple conversation. Our class was much like our group “eclectic”! I was thrilled to see the young lady in class which I talked about in “kicking around”. During our class we discussed research extensively. One student was a history teacher of 33 years and I can only imagine how excited she would get doing research. All in all it was a great first attempt and I’m looking forward to doing more of these classes in the future. RESEARCH, RESEARCH, RESEARCH- I decided to take next Monday off of work and spend the day metal detecting. I have a few little towns picked out that I want to visit. I started doing some research and I was quickly amazed at how much of our state was settled many years before my local area. In my immediate area stuff didn’t start happening until the late 1870’s and early 1880’s. I hope to find some old stuff in towns that were around 30 years previously. Could I find a Large Cent, Three Center, Shield Nickels, Seated coins, or maybe a stash of old tokens.. Who knows but I am hopeful. During our class today I encouraged our students to not get discouraged quickly. It takes time to learn how to do research, learn your machine, and just get our ears in tune to the sounds our machines make. I remember the first couple months of detecting and I was totally baffled by the beeps, bells, and dongs that my Ace makes. Give it some time and all the pieces of this wonderful hobby will start falling into place. I thought I would pass that along to my more rookie readers. I have written about this in the past while discussing upgrading detectors and why I have struggled with upgrading. I have learned what my Little Ace 250 is telling me and I am comfortable with it. There you have it Ramblings from a rookie.. Oh wait Miner says I can’t consider myself a rookie since finding a seated coin. Ramblings from a seasoned rookie? Either way I’m stoked and ready to go find some stuff! For the last couple of months I have been talking to all the major manufacturers about supplies for our upcoming metal detecting class. My family has been a little taken back by random boxes showing up on the front porch. 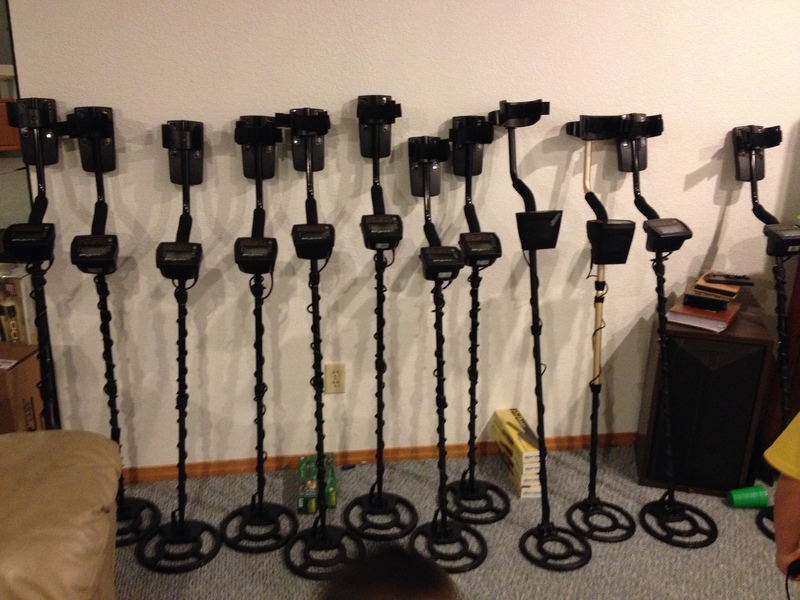 Tonight I decided it was time to get busy and we built twelve metal detectors. I want to personally say thank you to the following companies for supporting our cause. Our students will be using equipment that is on loan or donated from these companies. Whites, Garrett, Bounty Hunter, Fisher, Minelab, and Tesoro have all pitched in to make sure our participants will have equipment to use during the hunt portion of our class. I am getting very excited for our class this Saturday and I’m certain it will be a success. We will be presenting our participants with literature from all manufacturers and one lucky person will own a new White’s metal detector. I haven’t said much about the detecting shows on TV in the past. I think there are a couple of shows out there that have good intentions. Those intentions seem to get twisted and manipulated into a “dramatized for television” show. Does this give people a false hope of our hobby? Probably.. Does it make people think it is easy to get on great dirt? Probably.. Does it make people think every relic will get you serious cash? I hope not. I would love to see a survey given to us MDers asking what we want in a show. I think you could pick out 10 of the best mders from different types of hunting and have a really excellent show. Have them talk about their research, how they got permission, how much time they spent at the site, how they hunted it, which machine they used, and what they found. I wanted to get a rough idea of how many people are in the hobby and admit it. One popular forum has 33,000 members. I have to think many mders would tune into the show for knowledge, stories, and to envy the finds. I would also bet that many others who like history would watch. Do you think Arkies, as Mr. Stout calls them would respect us more without all the drama? I think the hobby deserves to be represented fairly and accurately. Over the last two weeks I have been involved in two conversations with people who asked how to find gold. I didn’t tell them that I dig pounds of gold. I told them that searching for gold is brutal and it takes extreme patience. 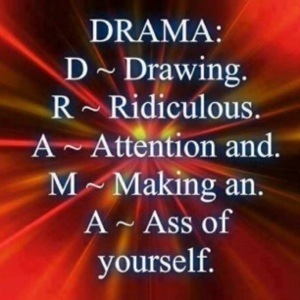 In closing I ask do we really need the drama? Would we be better off without it? Let your opinions fly! Well I haven’t been detecting much and when I have been my mind hasn’t been in the game. This transfers to other parts of my world as well. While playing pool last night I wasn’t focused and made poor decisions. It seems as though work and life have been running me ragged. Tonight two of the Ukena boys had soccer events in two different cities at the same time. While I took the middle boy to his practice I decided that I would detect at the school yard that they were playing on. 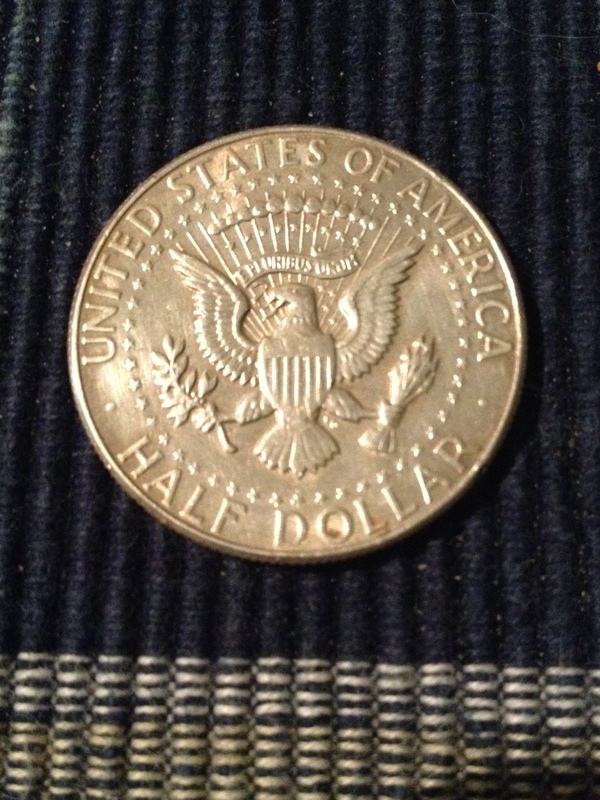 Last week I found a pocket spill of old clad at this school that pushed the $2.00 mark. The coins were old enough and shallow enough that I decided it hadn’t been detected to death and could hold some goodies. The school was built in 1957 and most of the ground hasn’t changed much. I started out along a tree row headed towards the soccer field so that I could watch the practice while listening to the tones of the detector. About twenty minutes into the hunt I see a lady trying to convince her dog that he/she should walk beside her and not just chill in the middle of the field. I chuckled and made a comment about the dog needing a break and went about doing what I do. A few minutes later she approaches me and asks if I know about metal detectors. My reply was an honest yes. During our conversation we discussed the plethora of detector options and how someone would go about picking out a first and other questions concerning the hobby. She mentioned that she had read a couple of articles in the past that intrigued her enough to be interested in our fine hobby. I started babbling about the Wheat State Treasure Hunters and our upcoming class. Immediately I could see the gears turning in her head. She was getting excited about learning. Up until this point I had dug a few clad coins but nothing exciting. I wish she had hung around a little longer because the next target was my first interesting find of the evening. 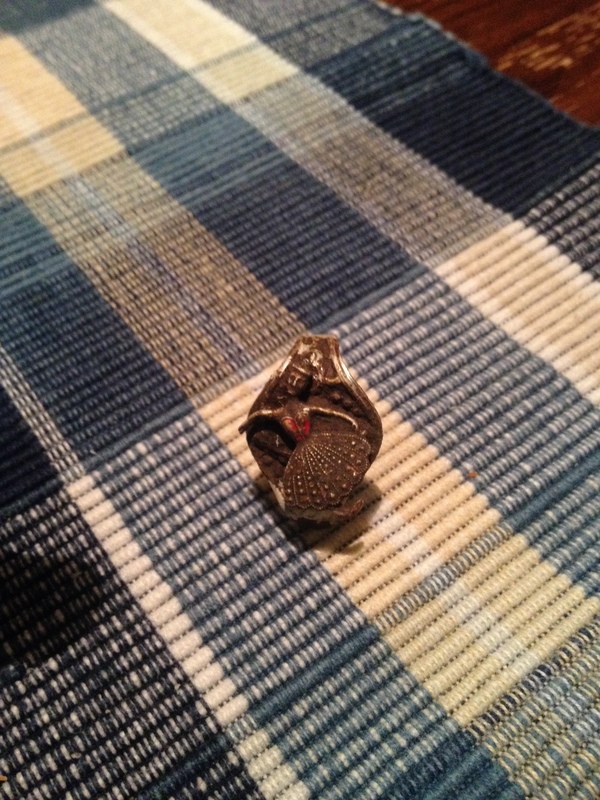 It’s an adjustable ring that appears to be either gold plated aluminum or gold plated silver. The ballerina on the ring immediately made me think of the Dave Matthews song “Dancing Nancies”. The very next target ID’d perfectly on the White’s Prizm 6T that I was using tonight. When I dug my plug I could clearly see the silver rim coming out of the clod. 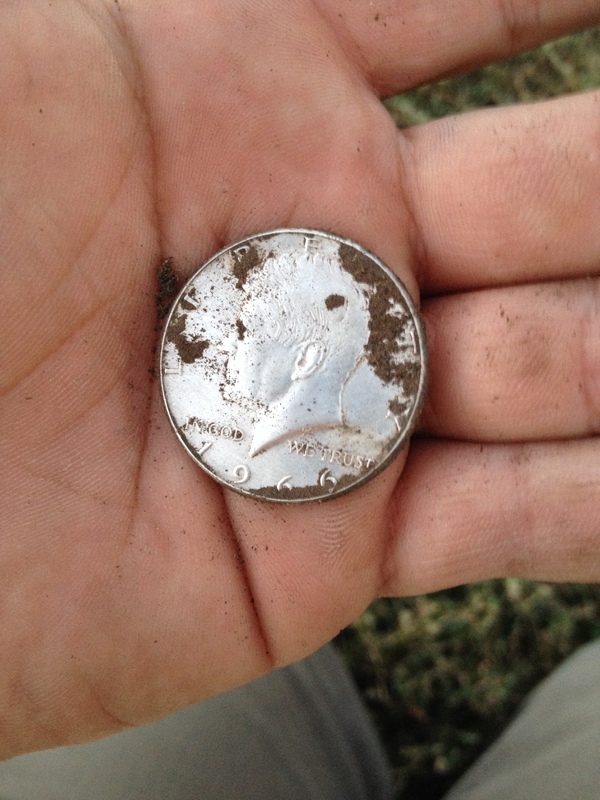 Once I got the coin out of the ground I realized that it was a 1966 Kennedy half. Only 40% silver but I will take it. I got it home and cleaned it. Once I got it dirt free I was amazed at the condition.